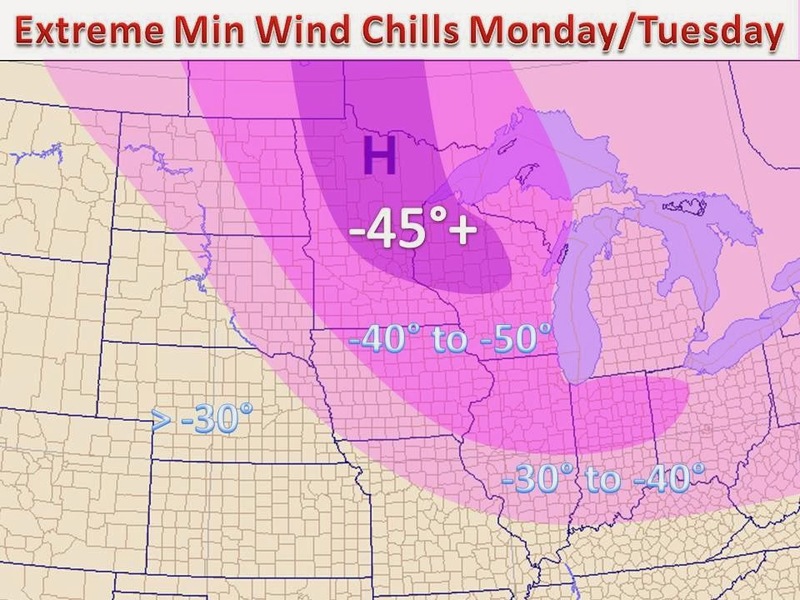 Exactly 3 weeks after the widely covered media event that was the "Polar Vortex"...another Arctic blast is on tap next week for Monday and Tuesday across all of the Midwest. A piece of the polar vortex will break off the main circulation and will be sent due south by early next week. Along with high temperatures stuck below zero, gusty winds will pose a major problem in terms of extreme wind chill. Widespread wind chill warnings will be posted yet again, especially in the darker two shades on the map, where wind chill under -40 will be common. On the right is the map of 850mb temperatures off the NWS GFS computer model. This is similar to the airmass in place three weeks ago, but will not be as expansive. Schools will close in many areas yet again, but a statewide shutdown is not quite expected at this time. The cold looks to stick around over the next 10+ days throughout all of the Midwest, as winter is holding its own. It is safe to say our winter forecast Click Here! has panned out. A possible turn around to above normal temperatures is possible in the next 3-4 weeks.